Hidden snap closure. 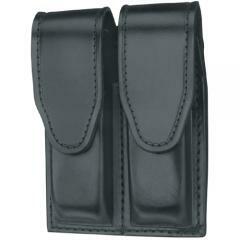 For vertical or horizontal magazine carry. Fits duty belts up to 2.25"
Well-crafted, handsome and utilitarian piece of equipment. Do you have this style to fit a Beretta Model 92A1, with a 17 round double stack magazine? Yes, the "Beretta 92fs" fit will work with the 17 round magazine.